The promise of the next industrial revolution — Industry 4.0 — is that it marries the best of cyber-physical systems and the Industrial Internet of Things (IIoT) to deliver efficiencies in manufacturing. Manufacturing trends driving smart factories lean on future-forward technologies such as cloud computing, artificial intelligence and machine learning, so original equipment manufacturers can do more with less and function on highly automated, self-auditing and self-calibrating levels. Mobile devices are increasingly the communications tools of choice in the smart factories of tomorrow. A study by LNS Research and MESA International points to a steady mobile adoption on the plant floor, with 54 percent of plant supervisors and 53 percent of managers expecting to rely on mobile devices as the information conduit for all their job-related tasks. Since mobility delivers strong and secure computing access on the go and in rugged situations, these numbers are expected to rise as more original equipment manufacturers (OEMs) make the switch to mobile. Given the wide variety of mobile devices — tablets, phones and wearables to name a few — which ones function best as manufacturing communications tools? The answer really depends on the tasks that OEMs are looking to accomplish and how completely they expect to transition to mobility. Rugged mobile devices such as the Samsung Tab Active2 enable plant workers to seamlessly perform a number of manufacturing-related tasks. OEMs can set up a few tablets on the plant floor that enable workers to punch into and out of work, request time off, check on the status of work orders, pull up machine drawings and diagrams of finished products, and use augmented reality to compare and contrast current metrics against the ideal. Alternatively, smart factories assign a dedicated tablet to each piece of machinery. Workers can securely log in to each tablet using biometric data, pull up asset management software to check on error logs when alerted and file for repair orders if needed. Mobility effectively aids in task management and increases employee productivity. Plant supervisors and managers on the go in smart factories can’t afford to stay tethered to a desktop or draft a paper checklist of to-do items to attend to later. Instead, they can use mobile phones such as the Samsung Galaxy Note9 to accomplish all their daily tasks, from the factory floor, the warehouse, the executive suite or wherever else they are. In addition to facilitating task management from anywhere, the Galaxy Note9 offers note-taking, form filling and document markup using the attached S Pen. Users can also switch to desktop mode with Samsung DeX, a unique built-in capability that enables them to connect to a monitor, keyboard and mouse with an HDMI adapter. With DeX, plant supervisors and managers can rely on their phones as their primary computing devices, because they can connect to any hot desk at a moment’s notice. When the company uses a VDI desktop or has all its core applications mobilized, the end user never needs a dedicated laptop or desktop, because the phone is their computer. Manufacturing trends point to an increasing embrace of machine learning algorithms that can deliver predictive maintenance in asset management. Essentially, embedded sensors on the factory floor report constantly on asset conditions, and that data is analyzed by machine learning algorithms in an edge processing environment or in the cloud. When new data from the machine (the temperature on a rotor, for example) falls outside preprogrammed boundaries, plant workers will receive an alert about potential system failure through a wearable device such as the Samsung Gear S3. A worker who has received an alert can then log in to the enterprise resource planning (ERP) or asset management software on a dedicated mobile tablet to pull up error logs and troubleshoot the production process accordingly. The advantages of these lean manufacturing techniques are manifold: They maximize use of machines and allow production to run without babysitting. Employees intervene only when they have to. 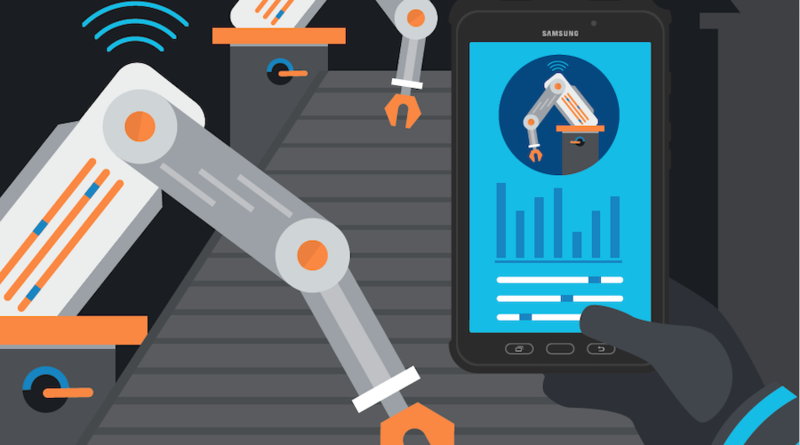 Smart factories work with a combination of mobile tablets, phones and wearables in concert to accomplish a variety of tasks, improve employee productivity and deliver efficiencies in a number of key performance indicators.